Social Vending: The New Wave of Vending Machines? Yesterday, soda make Pepsi announced their newest product – not a new soda, but a different kind of vending machine system. 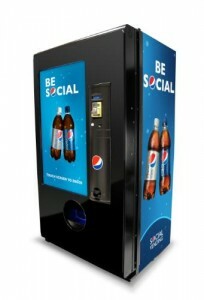 Riding on the popularity wave of everything social, Pepsi has introduced the idea of “social vending”. No worries – you’ll still recognize the vending machines for what they are, but you’ll be able to do a few new tricks with them. The idea is to provide consumers with a touch screen interface, which allows consumers to send gifts – Pepsi products only, of course – to their friends. You can even record a short video via the same machine. The interface will ask you to select the product that you want to send as a gift and then prompt you to enter the recipient’s name and mobile phone number. You can also send a text message to accompany your gift. Honest thoughts: “social” can only go so far. While this social vending system is a novel idea, I can’t see the need for it. Is Pepsi aiming to be the Facebook of sodas? Then again, maybe I am being short-sighted. Oh, and maybe because I drink Coke anyway. What do you think? Will the features of the social vending system be useful for you?